When Ant receives a special invitation to dine with Lion, she is ready to be on her best behavior. During dessert, the other guests do not mind their manners, each one taking half of the remaining cake as it is passed around. By the time it reaches Ant, barely a crumb is left for her to share with the King! 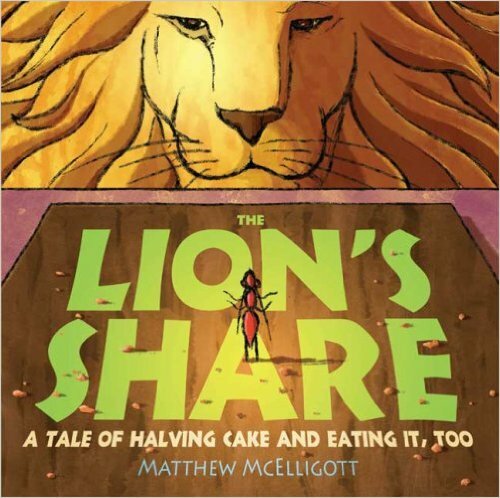 In ‘The Lion’s Share’ (2009), Matthew McElligott cleverly finds a way to meaningfully embed the concepts of halving, doubling and fractions in the same story. The story follows a humble ant who gets invited to King Lion’s dinner party. Later at the dinner, a cake is being passed around. The greedy elephant starts by taking half of the cake, and each of the remaining animal guests then takes half of the remaining cake. By the time it gets to the ant, only a very tiny slice of cake remains. When she attempts to halve it to share with the King, it crumbles. Feeling mortified, the ant promises to bake a cake for the King. Not to be outdone, each of the other animals then takes turn to try to impress the King by promising to bake twice as much cake as the previous animal’s promise. Soon enough, the number of cakes to be baked is growing rapidly. How many cakes will the last animal have to bake?! The storyline is endearing, with adorable characters. Beyond mathematics, the story also touches on the concept of sharing and being considerate to others. Matthew’s illustration of ‘The Lion’s Share’ is superb. We particularly love the cool sunglasses-wearing gorilla. The mathematical visualisation throughout the story is clear and accurate. We find the book’s last two pages showing the cake in different stages of being cut (starting from a whole to a half all the way to 1/128), as accompanied by relevant fractions, particularly useful. Gender representation in the cast is fair. All in all, we highly recommend ‘The Lion’s Share’. Recommended for children aged 7+ years old.